The three-point hitch is a standardized method of attching implements (equipment) to tractors, first developed by Harry Ferguson in the 1920s. The hitch uses two lower connection points and one upper point which provides a rigid connection. Hydraulic cylinders operate on the lower arms to raise and lower the implement. An additional hydraulic arm may act on the upper arm to control the draft (depth) of tillage equipment. 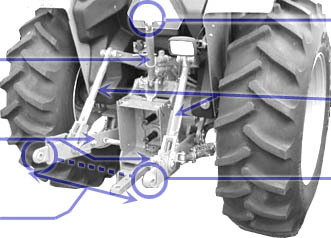 A significant advantage of the three-point hitch is that it converts the drag of the equipment into a downward force on the rear of the tractor. This means that the traction is maximized when the pulling is most difficult. The modern three-point hitch began with experiments by Harry Ferguson in the 1920s and 1930s. During World War I, Ferguson served as a sales agent in Ireland for the Overtime tractors, which were imported Waterloo Boys. This period provided Ferguson with considerable experience at the start of mechanized farming in Ireland and England. Most early tractor plows were trailer-mounted and merely pulled behind the tractor. Often, the biggest problem was not the raw power of the tractor, but gaining enough traction to put the power to use. Early tractors were very heavy and employed steel lugs to try and achieve enough traction.